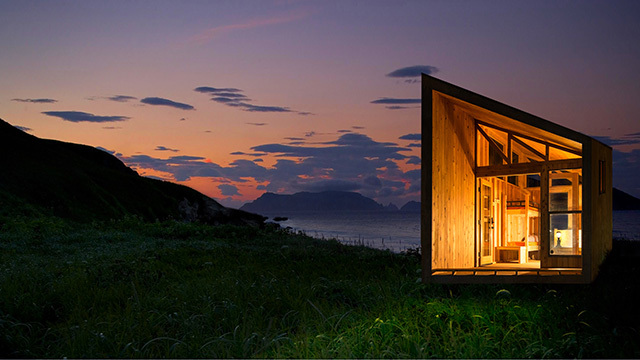 The “Wedge” cabin designed by Cal Poly Pomona students can be rented at Julia Pfeiffer Burns State Park near Big Sur. The students, Emily Williams, Bryan Charney and Antonio Fernandez (’16, master’s in architecture), designed the cabin in 2014 in response to a challenge from the independent Parks Forward Commission, which was looking for concepts that would generate interest among groups that are not typical campers, including younger people and minorities. cabins, and the Wedge was one of three finalists. 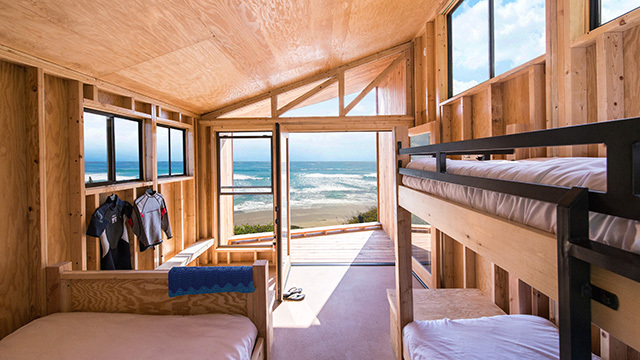 Constructed from recycled materials, the Wedge is a 156-square-foot structure that fits a double bed and a bunk bed. The model garnered rave reviews when it debuted at the Los Angeles County Fair and the California State Fair in 2014. It also captured the interest of California State Parks and the California Coastal Commission as a way to implement a low-cost and eco-friendly camping option to attract a wider range of Californians to the great outdoors. The California State Parks Cabin Project is one of several “transformation” initiatives designed to draw more visitors to the parks and inspire long-term relationships with the outdoors. A survey identified 750 potential sites for cabins in 51 parks. The Wedge cabin in Big Sur opened last spring and is so popular that more cabins for that location are in the planning phase. In addition, California State Parks plans to build 13 cabins on Angel Island State Park in the San Francisco Bay and 10 to 15 cabins with the Cal Poly Pomona design at Calaveras Big Trees State Park. Three Wedge cabins will also open at Santa Rosa’s Spring Lake Regional Park in early 2017. The cabin earned a Citation Award in the Inspire Category at the American Institute of Architects Orange County Chapter 2015 Design Awards Gala. IF YOU GO: Bookings for the Wedge cabin fill up fast. Reserve at least seven months ahead. allowed at campsite but not on the trails. Mercedes Quiroz is the university web editor in the Department of Strategic Communications at Cal Poly Pomona. She manages the university home page, several university marketing and communications websites, and social media.